Joy, happiness, playfulness, sleepiness, and even hunger are emotions that can be conveyed by humans and dogs alike, what about the other side of those emotions? What about sadness, can dogs feel sadness? This is a question that has been presented several times. And if they can actually cry, why do they cry? Is there anything that can be done to make him stop crying? The facts say yes and no. Dogs have a strong sense for emotions and they seem to have empathy for their owners. Dogs usually develop very strong bonds with their owners, they can tell how their owners are feeling. They feel bad when their owner is sad or crying and they get excited when their owner is happy. But can they feel the emotional pain and cry tears? Can Dogs Cry, Just Like Us? When we as humans, think of crying we think of an emotional state of mind; happiness, sadness, or even pain. Dogs are in tune with people. They often exhibit human emotions too happiness and excitement for example. When people are sad, dogs seem to be more attentive and affectionate. They sense when people are sad, so it seems natural that they themselves are able to cry. Humans are the only species that quite clearly cry for the reasons we do and the way we do. Obviously dogs do not have emotional break downs where they fall to their knees in hysterical sobs, with giant alligator tears stream down their poor faces. Actually there is no real reason why humans do this either. Technically they have the capability to kind of cry. Dogs, like humans and many other animals have tear ducts. Tear ducts help keep the eyeballs moist. 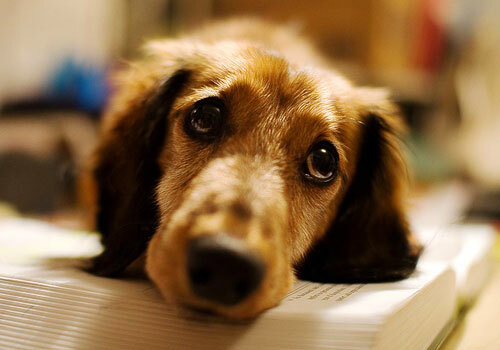 Dogs with flatter faces do tend to have more incidents of tears plainly due to the exposure of their eyes. Dogs with droopy eyes also tend to have more “tears” due to the lack of protection for their eyes. So yes, dogs may occasionally have seepage from their eyes that may appear to be tears. However the emotional attachment that comes with human tears does not seem to happen with dogs. Nothing links the so called “tears” of a dog to emotions. Watch this video on a mother dog crying when her puppies were rescued and decide for yourself. 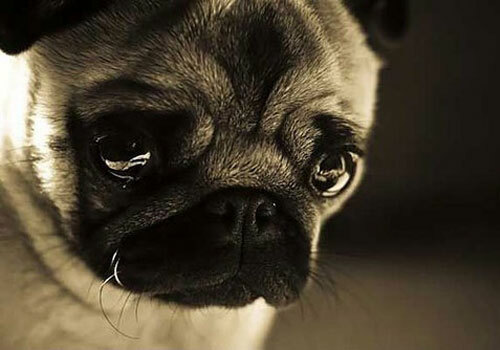 Why Do Dogs Cry Tears? Dogs do indeed exhibit emotions. They jump and bark or wag their tails when they are excited and happy. They show anger when they feel as if they or their owners are threatened. They whine or seemingly pout when their owners leave without taking them or when they don’t get the treat they expected. A dog can show sadness and depression though their whining or mopey behavior, and tears do not come with those expressions. One of the greatest emotions dogs exhibit is probably empathy. They sense sadness and can comfort someone in need. They can comfort without shedding their own emotional tears. 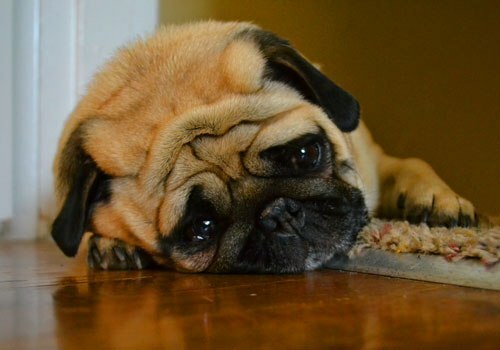 So if dogs are not crying for sadness or joy, why do they cry? Unfortunately the sign of tears from your dog is a sign of something being wrong. It could be something minor such as dirt in his eye or some other irritant. It also could mean there is an infection in his eyes, ears, or even an upper respiratory. Your dog could suffer from a condition that causes them to have watery eyes. Some breeds also appear to be “teary eyed” after sneezing. A dogs tears may also be triggered by an allergic reaction, if your dog is an inside dog it should be fairly simple to figure out what is causing the reaction, if he is an outside hound it may be slightly more difficult. Dogs can have outside allergies just like humans for example pollen or cotton in the air could cause watery eyes. It should be comforting to know that doggie tears do not link to pain. Tears are not a good indicator of pain since dogs are typically more vocal when it comes to pain. They might whimper or whine when they feel pain, they do not shed tears in pain. They do not even shed tears of discomfort. What Can I Do About It? How to Stop Him Crying? If you notice your dog crying after initial concern the next question naturally is how to make him stop. Typically making a dog stop crying will consist of finding out why he is crying to begin with. 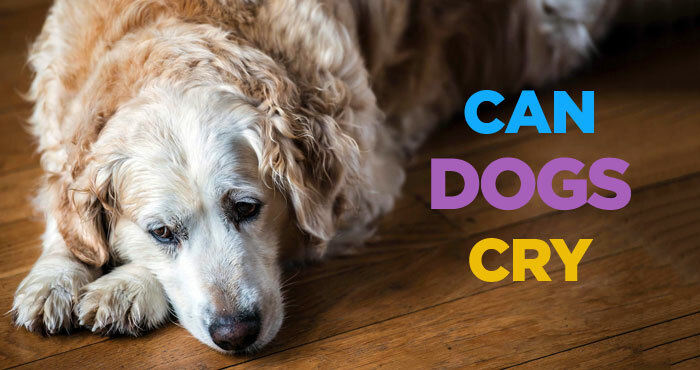 If you recently changed dog food, or washed his bed with a new laundry soap, or a tried a new product on the carpet it could be the cause of your dogs tears. If the eye(s) seems red and irritated it could be an allergic reaction, it could be allergies to dust or another animal, however, it may be as simple as gently wiping his eyes out with a warm wash cloth to remove any irritants or debris. If it’s not apparent that there is debris or something bothering his eyes than the best option is to take him to a professional to run some tests. A veterinarian can either prescribe the medicine he needs to clear up an infection, help with common allergies, or safely remove the debris. Sometimes medicine is as temporary as a few days of antibiotics to treat a minor infection, however, sometimes it may be something your dog will need to be on for an extended period of time for things such as a more serious infection or a condition. Although our dogs are very sensitive to our sadness and other emotions they do not express emotions the same way humans do. 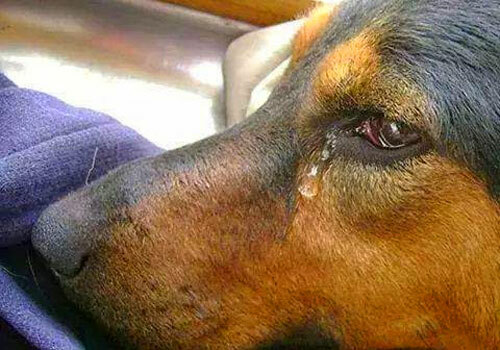 Yes, dogs can cry, however they do not cry tears of emotion. When a dog appears to be crying it is a sign of underlying issues. Issues such as infection, an irritant in the ocular area, allergies, or an even a cold. In order to make your dog stop crying you must figure out what is causing him to cry, in some cases will require the diagnosis and assistance of a veterinarian. Thanks Melissa for sharing this. Did you take him to vet? If not already, take him to a vet for proper treatment. I hope your Chihuahua get well pretty soon. Thanks for this. I just saw the video on Facebook, the same one you have here on this page. I had never heard of a dog “crying”, did a Google search, and found your article. So that means that something else is bothering the mama dog’s eyes. I hope they got her checked out. When I scolded my dog he coward and his eyes watered more than they usually do. It is interesting that you brought up allergens as my dog has allergies. There is nothing wrong with him but I help comfort him and he soon stopped crying. My Radar has cried tears 2 times in the 2 years we have had him… both times when he was scolded and told to go lie down on his bed for a while. When I went back to check on him, he was lying with his chin resting on his paws and had tears running down his cheeks. When I told him it was okay and pet him, the tears stopped immediately. Can’t find any other instant in the two situations other than the scolding. I just can’t buy your theory… sorry. I agree with Gail. I just don’t understand how your tear ducts would only water when you have allergies, but not when you’re crying. It just doesn’t make sense to me. I believe any animal with tear ducts that water can cry tears. Plus, being humans and not animals ourselves, we can never really tell. With animal brains, our theories are just predictions and.. well.. theories. No one but God can tell what animals are actually thinking or feeling. The facial expressions, body language, and sounds are the only ways we can tell how they feel, but we can’t tell what they shed tears for at the time. That is the fact. The fact is: only God knows. He made us all. In some cases, the dog may shed tears, but in other cases, he could just be dad without crying. Just like humans, they cab whine and shed tears, but they cab also be dad without tears. In conclusion, we humans are also animals considering we possess animal cells, so if we can cry tears, why can’t other animals? They are no different scientifically. My dog had tears in his eyes the night of his home euthanization; I was crying and enface with my friend and his eyes also welled up with tears… I miss my friend. Hi Michele; I found your article to be quite interesting. I have wondered whether my male Yorkshire Terrier cries at times. If I could share a bit of history. I believe dogs do cry. Here is why. Vinny (my male Yorky’name) I have had since he was a very young tiny puppy. He is now about 8 years old. He is my only family & friend so I have and do spend a great deal of time with him. About 31/2 years ago I found a tiny adult female Yorkshire Terrier Penelope that needed a home. At the time I purchased the little female Yorky, I was working 12 hour shifts at night at a local hospital. Being a full time RN and my work schedule several night I felt Vinny needed a companion. The two of them were very possessive of me from the start. I have always shown love to both of them the same. We play fetch or spend time in the yard. Vinny gets a bit more attention since I have had him the longest. Penelope could join in but she would rather sit and watch, she is a bit of a Diva. There are times when I take a bit longer brushing Penelopes hair out of her eyes. Sometimes, I will look over at Vinny. Vinnys head will be down and he will have big tears coming from his eyes and big tears in his eyes. When this happens to Vinny, I wipe his tears with a Kleenex. Then I pick him up. And love him dearly. Vinny has a sweet and sensitive heart. Thanks Luanne for sharing. 🙂 Loved it.